Billy Mays Dead? What Next? As reported by Fox News, Tampa Bay Online, the Tampa Bay Business Journal, and the Associated Press (via MSNBC), TV pitchman Billy Mays was found dead in his Tampa home. They say he was found unresponsive and was pronounced dead early this morning. Wow, this makes for quite an interesting week! The month had started off in a weird way with the announced death of actor David Carradine on June 3rd. But the past week has seemed weirder than all of the speculation put around Carradine’s death. June 23rd, Ed MacMahon, the voice of the Tonight Show starring Johnny Carson, passed. He was definitely a big name in the entertainment world for many decades. He and Carson both made for a great late night show which I would love to see more of. Then, two days later, on June 25th, we first heard of the death of Farrah Fawcett from cancer. Her looks, and her time as one of Charlie’s Angels, made her an international star. Then, later that same day (and pretty much stealing the headlines, even to today), Michael Jackson died from cardiac arrest. All you have to do is look at how the media is still covering his death, as well as see all of the tributes that have gone up to him (and, to a lesser extent, Farrah Fawcett) to see how people reacted to their deaths. Now, the crazy news for today. In less than a week since Ed MacMahon’s death, Billy Mays is found dead. It seems so crazy to hear about yet another big named celebrity to die. Granted, time and unforeseen occurance befalls everyone, but it still is making for an interesting week. So, goodbye, Billy Mays. OxiClean, Orange Glo, Kaboom, Handy Switch, iCan, Steam Buddy, Tool Bandit, Gopher, and every other product you were the front man for will never be the same again. Well, maybe the same, but just quieter. Now… I wonder what news we’ll be seeing this week. Wednesday, I went to see Eric Clapton and Steven Winwood in concert. I’ve been asked by a few people how the concert was. Well, I will be writing a thorough review and posting it tomorrow for all to read. I will try to include all that I can remember and describe things as best as possible. I hope you’re eager to read it! Given how some people seem to not fully understand how the new Star Trek movie fits in with all other things Trek, I think it is appropriate to write a little about this. Since the new movie has come out, I’ve heard various things. For example, I’ve heard some say that this ruins all Trek given what happens in the movie. Others have said that this finally explains how Kirk and Spock (and company) meet up. 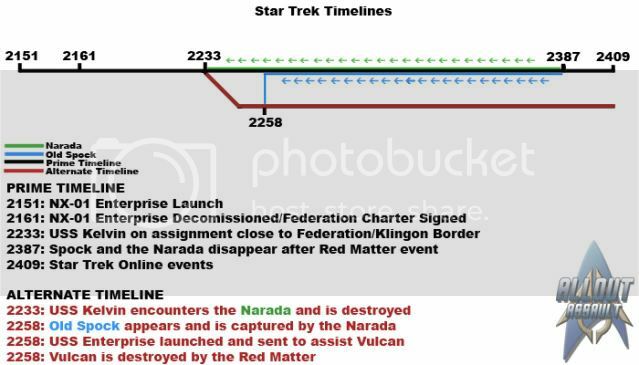 I think that picture definitely helps with explaining how the new movie’s timeline affects (or rather, does not affect) what is already established. Am I (or others) just making this up? Nope! The dialogue was said on screen, in the movie, between Uhura and Spock. If you don’t believe me, go watch the movie again. So, did this new movie ruin previous Trek? Did it tell us the hidden truth behind Kirk and Spock’s friendship? Did it show how the crew found themselves together on the Enterprise? Keep that in mind the next time you hear someone say one of the things above. It may help them better understand the movie (and any future ones that may come from JJ Abrams).